A mechanical computer is built from mechanical components such as levers and gears, rather than electronic components. The most common examples are adding machines and mechanical counters, which use the turning of gears to increment output displays. More complex examples could carry out multiplication and division—Friden used a moving head which paused at each column—and even differential analysis. One model[which?] sold in the 1960s calculated square roots. 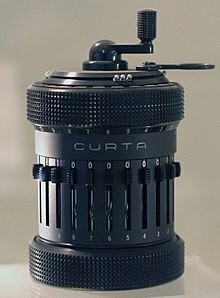 Mechanical computers can be either analog, using smooth mechanisms such as curved plates or slide rules for computations; or digital, which use gears. Mechanical computers reached their zenith during World War II, when they formed the basis of complex bombsights including the Norden, as well as the similar devices for ship computations such as the US Torpedo Data Computer or British Admiralty Fire Control Table. Noteworthy are mechanical flight instruments for early spacecraft, which provided their computed output not in the form of digits, but through the displacements of indicator surfaces. From Yuri Gagarin's first manned spaceflight until 2002, every manned Soviet and Russian spacecraft Vostok, Voskhod and Soyuz was equipped with a Globus instrument showing the apparent movement of the Earth under the spacecraft through the displacement of a miniature terrestrial globe, plus latitude and longitude indicators. Mechanical computers continued to be used into the 1960s, but were quickly replaced by electronic calculators, which—with cathode-ray tube output—emerged in the mid-1960s. The evolution culminated in the 1970s with the introduction of inexpensive handheld electronic calculators. Mechanical computers were ailing in the 1970s and dead by the 1980s. In 2016, NASA announced that its Automaton Rover for Extreme Environments program would use a mechanical computer to operate in the harsh environmental conditions found on Venus. Pascaline, 1642 – Blaise Pascal's arithmetic machine primarily intended as an adding machine which could add and subtract two numbers directly, as well as multiply and divide by repetition. Stepped Reckoner, 1672 – Gottfried Wilhelm Leibniz's mechanical calculator that could add, subtract, multiply, and divide. Difference Engine, 1822 – Charles Babbage's mechanical device to calculate polynomials. Analytical Engine, 1837 – A later Charles Babbage device that could be said to encapsulate most of the elements of modern computers. Ball-and-disk integrator, 1886 – William Thomson used it in his Harmonic Analyser to measure tide heights by calculating coefficients of a Fourier series. Marchant Calculator, 1918 – Most advanced of the mechanical calculators. The key design was by Carl Friden. Mark I Fire Control Computer, deployed by the United States Navy during World War II (1939 to 1945) and up to 1969 or later. Moniac, 1949 – An analog computer used to model or simulate the UK economy. Automaton – Mechanical devices that, in some cases, can store data and perform calculations, and perform other complicated tasks. Early electrically powered computers constructed from switches and relay logic rather than vacuum tubes (thermionic valves) or transistors (from which later electronic computers were constructed) are classified as electro-mechanical computers. These varied greatly in design and capabilities, with some later units capable of floating point arithmetic. Some relay-based computers remained in service after the development of vacuum-tube computers, where their slower speed was compensated for by good reliability. Some models were built as duplicate processors to detect errors, or could detect errors and retry the instruction. A few models were sold commercially with multiple units produced, but many designs were experimental one-off productions. ^ Hall, Loura (2016-04-01). "Automaton Rover for Extreme Environments (AREE)". NASA. Retrieved 2017-08-29. ^ Lavington, Simon Hugh (1980). Early British Computers: The Story of Vintage Computers and the People who Built Them. Manchester University Press. p. 62. ISBN 9780719008108. ^ "Fujitsu Facom 100". Retrieved 2017-07-26. ^ "FACOM 128A and 128B Relay Computers". Retrieved 2017-07-26. ^ "Profile for Tony Brooker at the University of Essex". www.essex.ac.uk. Retrieved 2018-05-19. ^ "Relay Digital Computer, Imperial College, Univ. of London". Digital Computer Newsletter. 3 (1): 4. April 1951. ^ Bowden, B. V. (ed.). "11. The Imperial College Computing Engine". Faster Than Thought. pp. 161–164 (103–105). ^ Boslaugh, David L. (2003). When Computers Went to Sea: The Digitization of the United States Navy. John Wiley & Sons. pp. 95–96. ISBN 9780471472209. ^ "The ONR Relay Computer". Digital Computer Newsletter. 4 (2): 2. April 1952. ^ A survey of automatic digital computers. Office of Naval Research, Dept. of the Navy. 1953. p. 75. ^ Wolf, J. Jay (1952). "The Office of Naval Research Relay Computer". Mathematics of Computation. 6 (40): 207–212. doi:10.1090/S0025-5718-1952-0050393-0. ISSN 0025-5718. ^ Augustine, Dolores L. (2007). Red Prometheus: Engineering and Dictatorship in East Germany, 1945–1990. MIT Press. p. 134. ISBN 9780262012362. ^ "Relay Computer RVM-1". Retrieved 2017-07-25. ^ a b c d e Belzer, Jack; Holzman, Albert G.; Kent, Allen (1976-03-01). Encyclopedia of Computer Science and Technology: Volume 3 – Ballistics Calculations to Box-Jenkins Approach to Time Series Analysis and Forecasting. CRC Press. pp. 197–200. ISBN 9780824722531. ^ Teuscher, Christof (2004). Alan Turing: Life and Legacy of a Great Thinker. Springer Science & Business Media. p. 46. ISBN 9783540200208. ^ Hodges, Andrew (2014-11-10). Alan Turing: The Enigma: The Book That Inspired the Film "The Imitation Game". Princeton University Press. pp. 175–177. ISBN 9781400865123. ^ "Harry Porter's Relay Computer". Retrieved 2017-07-26. This computer hardware article is a stub. You can help Wikipedia by expanding it.